Boden has a unique position of power supply – redundant, sustainable and free from interruption. Just outside of Boden is one of the national power grid substations, and one of the points where Swedens national grid connects to the Nordic grid. The national grid substation is located just 6 km from the Helicopter Airbase Area. Numerous feeders of the regional grid passes close to the site. 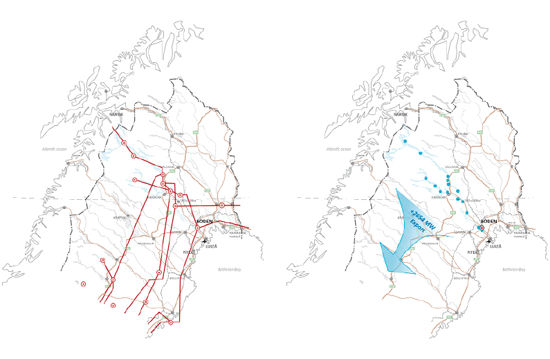 Luleå River produces annually approximately 4300 MW where approximately 2600 MW is exported from the region. This creates an unique abundance of power. The power supply offers great sustainability through the 100% renewable hydro power. Alternative back-up power up to 10MW could be generated from locally produced biogas. External back-up power supply through generators may not be necessary though.